"MARK NADLER seems to have been shot out of a cannon! Mr. Nadler is a singer-dancer-pianist Punchinello who doesn't exactly have an act. He has many acts, and in the course of an evening he does them all. The best commedia dell'arte in town!," wrote Rex Reed in The New York Observer, while David Finkle of The Village Voice declared, "Mark Nadler could be the most prodigiously talented entertainer working in America today!" What? You've never heard of Mark Nadler? If you were one of the people in the audience of the Charleston Heights Arts Center last January when Nadler and KT Sullivan performed their Sweet and Lowdown Gershwin show, no introduction is necessary. If you missed the performance, but read Las Vegas Review-Journal's theater critic, Anthony Del Valle's, review, you were probably sorry you weren't one of those lucky 300 that gave this show a standing O. Notoriously tough (community theater folks, both behind and in front of the curtain, shake in their boots waiting for the make-or-break opinions of Tony D.) Del Valle gave Sweet and Lowdown a well-deserved "A"! 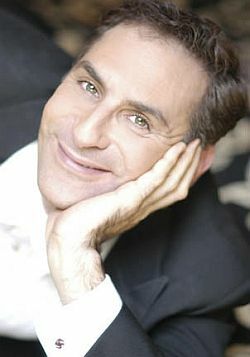 For his show, Tschaikowsky (and Other Russians), which he performed in New York's Algonquin Hotel, Firebird Supper Club, San Francisco's American Conservatory Theater and at the Adelaide Cabaret Festival in Adelaide, Australia, Mark was awarded the 2003 Bistro Award for "Continuing To Raise The Standards Of Cabaret Performance." He also won the 1994 Bistro Award for outstanding singer/instrumentalist and the 2000 Bistro Award for Outstanding Revue for directing, conceiving and music directing Hard Candy; the songs of Carol Hall. Mark tours also tours with his one man show for children, Pianomal Crackers. He created and co-stars in Something Wonderful: Richard Rodgers In Song which he has been touring with since 2001 and The Night They Invented Champagne: A Toast to Operetta and the Musicals it Inspired. With KT Sullivan, Nadler created and performs A Fine Romance: the Lyrics of Dorothy Fields; Everything's Coming Up Roses: the music of Jule Styne; Sweet and Lowdown: an evening of pure Gershwin; Are We A Pair: the songs of Sondheim; and Always: The Love Story of Irving Berlin, for which they received the 2004 Nightlife Award and the 2004 MAC Award, both for Outstanding Revue. Nadler has performed at Carnegie Hall with Skitch Henderson and the New York Pops Orchestra and been a guest soloist with the Baltimore, Oregon, Ottawa, Fort Worth, and Pittsburgh Symphonies. He has played New York City's Town Hall, Lincoln Center and in almost every major night-club in Manhattan and Los Angeles, including Sardi's, The Oak Room at the Algonquin Hotel, The Village Gate, the Cinegrill in the Hollywood Roosevelt Hotel, Maxim's, and the West Bank Cabaret where at 19 he was the house master-of-ceremonies and musical director. Abroad, Mark has performed in England, Ireland, France, Belgium, Holland and Australia. On Broadway Mark has appeared as "The Fingers On The Keys" in Dame Edna: The Royal Tour, and Pinky Pickles in The Sheik of Avenue 'B.' At Lincoln Center, Mark co-wrote, directed and starred in The Nose Knows, a tribute to Jimmy Durante for the "Reel to Real" series. Other New York theatrical credits include Nicky in Noel Coward's The Vortex for New Directions Theatre and leading roles in John Glines' productions of Robert Patrick's Untold Decades and To Dinner With Friends directed by Peter Pope. Favorite regional roles have been Tony Whitcomb, the outrageous hair-dresser in the Ft. Lauderdale and San Francisco companies of Shear Madness, and the octogenarian piano-ukulele and chimes playing, dancing and singing Miss Mabel in Radio Gals, (a role which he reprised for the cast album). On television Mark played Freddie Martini on, and was the musical director of Café DuArt. He was the miming ring-master of the International Cirque du Monde, and arranged and coached Glenn Close's performance of "Bye Bye Blackbird" for the film, Maxie. Mark is a graduate of the Interlochen Arts Academy and is Artistic Coordinator of the Cabaret Series at the Flushing Town Hall. Nadler was described by one critic as "having facial expressions like Mr. Bean, looking like Horowitz, moving about the stage like Spiderman, entertaining like Victor Borge, singing like Pavarotti and dancing like Fred Astaire." Presenting an afternoon of great songs, comedy and dance, you won't find a better entertainment bargain anywhere. Trust me. A word of advice: If you have any interest at all in seeing this fine performer, don't wait. Order your tickets now. It's a sure bet there will be no seats available come January. Sunday, January 8, 2006 3 p.m.